Apparently, this anime has two titles: Dogs: Stray Dogs Howling in the Dark and Dogs: Bullets and Carnage. Both appeared in the anime and both are referenced by the rest of the anime communities. These two names are from the two manga series this OVA is adapted from. So I guess they're implying this supposed to cover stories spans across the both mangas. The first two episodes have been out for a while, but it's been on my back burner because I have too much in my current running queue. This is a story about mobs and assassins (if you couldn't already tell from the title). Supposedly, there are only total four episodes in this OVA. After watching the first two, I'm not quite sure where they're going with it: In the first two episodes, it's mostly character introduction. And according to the synopsis, there are three more characters yet to be introduced. That'll leave no time for an actual plot, unless they're building the plot into the character introductions, which I'm yet to see any hint of it. Dogs: Bullets and Carnage is the title I've seen it more commonly referred to as. The first 2 eps were quite interesting but I agree I'm not actually sure where they were going. 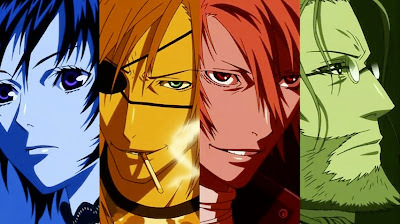 The Dogs: Bullets and Carnage is the main series Miwa did the first series Dogs: Stary Dogs Howling the Dark first as a sort of one shot he did but later on brought back the series to make an on-going series. The 4 Part OVA is the just DOgs: Stray Dogs Howling in the Dark which is really just an introduction to all of the characters and thier backgrounds. That's nice to know. Does it mean there'll be another OVA or TV series in the future? Otherwise what's the point of making an OVA for introduction purpose only?